We had a lot of freedom to roam. Getting to a battle zone meant hitchhiking on U.S. military planes and helicopters or, in some cases, driving to the action. Nobody asked us why we were going or where we were heading. One day, after driving an NBC jeep down a dirt road and arriving with my crew at an American firebase, I was halted by a sentry at the concertina-wire perimeter. “I want to thank you,” he said. The most freedom I ever had as a war correspondent was covering the conflicts in El Salvador and Nicaragua in the 1980s. Journalists could link up with either government forces or rebel forces with ease. News crews driving along in a jeep might encounter government troops on one part of the road and then guerillas on another. Some of my colleagues had T-shirts printed up with large targets on the back and the words “¡PERIODISTA-NO DISPARE!” (JOURNALIST-DON’T SHOOT!). War correspondents like gallows humor. One Salvadoran town called Cinquera routinely changed hands between the government and rebels, and you’d have to show your credentials to whatever side was in charge that day. Both sides recognized our status as neutral observers, but, one day, the city was between managers, and my two-man crew and I got caught in the crossfire. We low-crawled back to our car, which was plastered with the letters “TV” in gray tape, and got out of there. During Operation Desert Storm, Secretary of Defense Richard Cheney and the military brass at the Pentagon laid down new rules. Reporters and camera crews had to be accompanied by escorts (we called them “minders”), and our stories had to be submitted to military censors for review. The U.S. military formed “press pools” that were taken into the field but deliberately kept away from seeing combat. I spent much of the first Gulf War at the press center in Dhahran, Saudi Arabia, where we were able to report live, via satellite, but at some distance from the action. Most of our reporting was based on the military’s daily press briefings and not on firsthand observation. When my press pool eventually got into southern Iraq with a huge supply convoy, our group was hundreds of miles from the action. By the time our tame pictures got past the military censors, the fighting was over. If the U.S. government has changed how it treats war correspondents, so have many of the combatants. When I started out, hostile forces rarely targeted journalists. 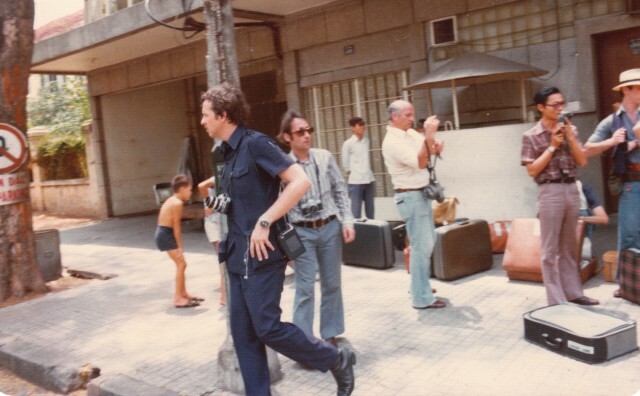 In November of 1979, I covered the taking of U.S. hostages at the American Embassy in Tehran, and even there I was rarely in danger. We’d talk to Iranian militants who’d threaten to imprison or kill us if we didn’t report the story their way, but they never followed up. Once, during a demonstration near the home of the Ayatollah Khomeini, my cameraman and I were accused of being spies and carted off to a military headquarters, where angry, bearded revolutionaries leveled their assault rifles at our heads. It was frightening, but once the demonstration ended, we were released. With cutbacks to news budgets, much of the reporting in the Middle East has been outsourced to freelancers, many of whom operate without all the resources we had in wars past. We also use increasing numbers of local “fixers” who interpret for us and handle the logistics of coverage. They shoulder many of the frontline risks, often without any sort of insurance should they get killed or wounded. In spite of all the changes in our business, one thing has remained constant for the war correspondent: the obligation to bear witness. There is no good way to describe the combat experience from a distance, so journalists must see the action up close. Even that isn’t fully adequate, though. Neither print nor television can capture what it’s like to cower in a ditch under heavy shelling, with ear-splitting explosions shaking the ground. Self-censorship also enters in. Grislier scenes get edited out of footage, because networks feel they must tone down the gore when they’re broadcasting into people’s homes. And, perhaps because I believed the story wasn’t about me, I seldom wrote about the fear I felt. Most war correspondents are young-people in their 20s or early 30s looking to make their mark in journalism. Some come equipped with a my-body-is-bulletproof attitude that can get them into trouble. (As a young man, I found myself slipping into it too, sometimes.) Others might resist such delusions but still rationalize the risks by telling themselves that these stories are historically important. But the truth is if you cover a war, you do so in the hope of getting plenty of airtime, which increases your value as a journalist. Having your story lead the nightly news can be exhilarating. So journalists have a delicate balancing act. We often proclaim, “There is no story worth dying for,” but no journalist who was killed while covering a story knew he or she was going to die. It’s always a matter of risk. How much is too much? And for how long do you play Russian roulette? I turned to other pursuits late in my career at the urging of family. “Dad, we want you around for a few more years,” one of my daughters told me. The intervention worked. My name is George, and I’m a recovering war junkie. In Bayeux, France, near the D-Day invasion sites of World War Two, stands a memorial to journalists killed on duty around the world since the Allied landings in 1944. It has 2,200 names so far, and new ones keep being added. Between 1955 and 1975, a total of 63 journalists got killed in Vietnam, according to the organization Reporters Without Borders. In Iraq, 150 journalists have been killed since 2003. Last year alone, 66 journalists were killed in trouble spots around the world, from Pakistan to Mexico. To all of them: Godspeed. George Lewis recently retired after 42 years with NBC News. *Photos courtesy of George Lewis.